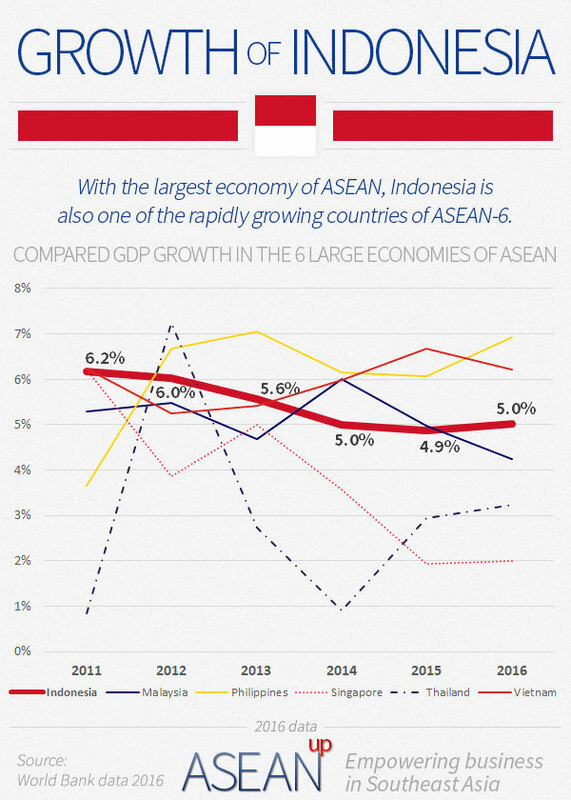 With the region's largest population and largest economy, Indonesia is the giant of Southeast Asia and one of the world's most populous democracy. Representing about 40% of the economy and the population of ASEAN, Indonesia is the region's only member of the G20. Its size and remarkable economic growth also attracts many investors. With its population of more than 260 million and growing middle-class and a nominal GDP of about 1 trillion USD, Indonesia now attracts all eyes of investors interested in grabbing a share of its massive and rapidly growing market. In transition towards a modern, industrial and service economy, Indonesia is growing away from its dependence on exports of raw materials. Though submitted to political changes inherent to its democracy, Indonesia shows a strong economic resilience. Its government aims at ambitious growth plans and tackling the challenges of connecting a country made up of more than 17,000 islands. With policies aiming at the development of new infrastructures, the Indonesian government targets long-term, sustainable growth and attractiveness through a business-friendly taxes that helps both small and large companies. With its large land area and tropical climate, Indonesia is rich in natural resources such as oil and minerals, timber and raw of semi-transformed agricultural products. However, to limit the country's dependence on commodities, increase the value added to the economy and develop the country that is still one of the least developed in Southeast Asia, the authorities are aiming at growing the economy away from the export of natural resources. Indonesia's large workforce make the country and ideal hub for industrial production. The country's large cities are transforming into specialized industrial and service hubs to help the modernization of its economy, notably through the industries of machinery, electronics, automotive and auto-parts. With its size, diversity and rich cultural heritage, Indonesia is also aiming at boosting its tourism and hospitality sector. Upon these strengths which notably include several UNESCO world heritage sites, the authorities rightfully promote tourism in the country as "Wonderful Indonesia". 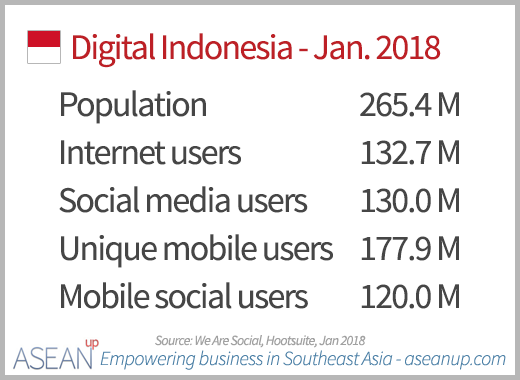 Indonesia's large population is also one of the most active on social media in the region. This very large and active digital community, and the growing penetration of mobile devices help the revolution of several underdeveloped industries like financial services through new FinTech startups. Indonesia provides a very diverse environment for foreigners willing to work in the country, depending on their situation: large cities like Jakarta, touristic destinations like Bali, or remote islands and countrysides. 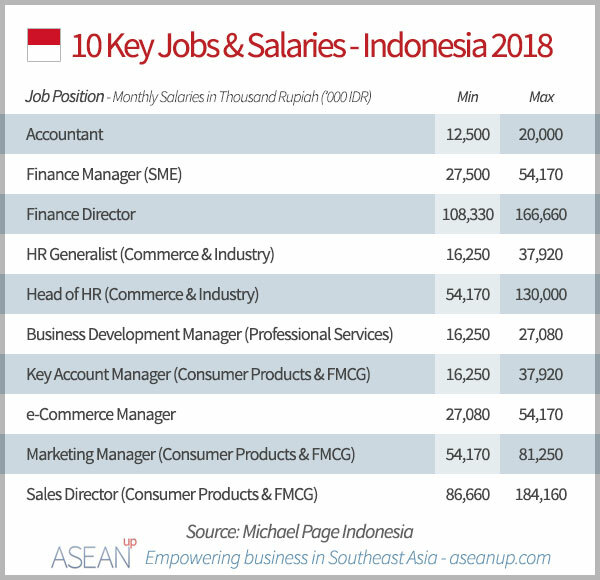 Salaries are lower than in other countries of the region, since the country is one of the least developed, but there are large differences between certain regions attracting foreigners such as Jakarta, Bali or Batam islands and the rest of the country. Though it is diversifying with industrial exports, Indonesia's trade is still heavily reliant upon raw materials and semi-transformed products.